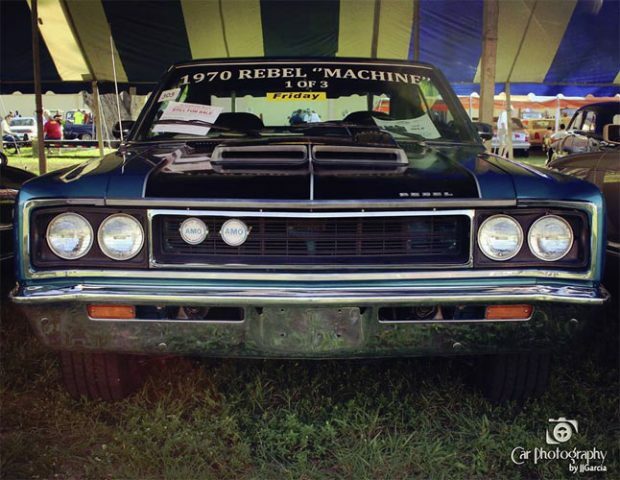 The Machine was an AMC Rebel that had a 340 hp and 430 lb·ft. of torque version of their 390cu. engine, a Borg-Warner T-10 four-speed manual with centre console pistol handle grip and on the exterior, usually red, white and blue stripes. The car sported upgraded valve train, cam, large ramair intake with mounted tachometer and exhaust. Gearing came in the form of 3.54:1 or 3.91:1 ratio was with a “Twin-Grip” differential. A total of 2,326 Rebel Machines were built in 1970.